Go grab the TOUR TEAM EXTREME Backpack for a trip to the courts or school. 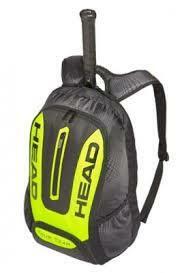 The sibling of the TOUR TEAM Backpack, it comes in a design inspired by the EXTREME racquet series. It gives you a padded racquet compartment, a ventilated shoe compartment that keeps your dirty footwear separated within the main compartment where you can store that extra t-shirt or long sleeved shirt. A front pocket provides easy access to a set of keys and the sidepocket offers additional room for any extra equipment.